Indiana’s Minimum Wage law applies to employers and governmental agencies with two (2) or more employees. Sometimes, the law falls well short of reasonable expectations. Sometimes, people suffer clear injuries, and the law simply fails to provide an adequate remedy. This is clearly the case in what happened in the matter of Richardson v. Town of Worthington, (Ind. Ct. App. Sept. 17, 2015). Richardson sought unpaid overtime wages under Indiana’s Minimum Wage law. As will be explained, because of Richardson’s unique circumstances, he is not able to prosecute his wage claim under either Indiana’s Minimum Wage law or under the Fair Labor Standards Act, the federal counterpart. Indiana’s Minimum Wage law applies to employers and governmental agencies with two (2) or more employees. Ind. Code § 22-2-2-3. However, Indiana’s Minimum Wage law does not apply to any employer that “is subject to the minimum wage provisions of the federal Fair Labor Standards Act.” Id. In other words, if Richardson’s employer was subject to the minimum wage portion of the Fair Labor Standards Act, then Richardson cannot prosecute a claim under Indiana’s Minimum Wage law. Richardson worked for the Town of Worthington’s Marshal’s Department. During Richardson’s employment, the Marshal’s Department had no more than three (3) employees. Here is the twist – although the Marshal’s Department was subject to the minimum wage portion of the Fair Labor Standards Act, the Marshal’s Department was exempt from the overtime provision of the Fair Labor Standards Act because it was a law enforcement agency with less than five (5) employees. 29 U.S.C. § 213(b)(20). This meant that Richardson could not bring a claim for unpaid overtime under the Fair Labor Standards Act to collect unpaid wages, but it was unclear whether Richardson could then bring a claim under Indiana’s Minimum Wage law. The trial court said no, and the Court of Appeals affirmed. Per the Court of Appeals’ rationale, “Worthington is subject to the FLSA’s minimum wage provisions. Therefore, it is exempt from the MWL and its overtime pay requirements.” This effectively leaves Richardson with an injury that has no cognizable legal cause of action in which to seek redress. Richardson cannot sue under the Fair Labor Standards Act for unpaid overtime because the agency had less than five (5) employees. 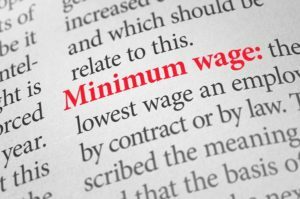 Richardson cannot sue under Indiana’s Minimum Wage law because it exempts any employer subject to the minimum wage provisions of the Fair Labor Standards Act. Even though the Marshal’s Department is not subject to the overtime provisions of the Fair Labor Standards Act, it was subject to the minimum wage provisions, unfortunately thereby making the entire Indiana Minimum Wage law unavailable to Richardson. I would expect for an appeal to Indiana’s Supreme Court on this issue. The Court of Appeals noted public policy considerations, but stated “we are bound by the intent of the legislature.” Indiana’ s Supreme Court might see things differently.